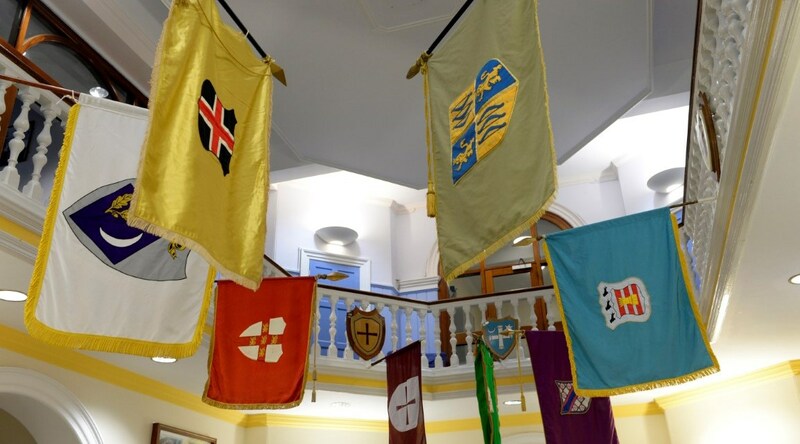 The house system was established when the school was founded and has grown to eight senior houses for both day and boarding pupils and staff. The houses are a very important part of school life and play a key role in achieving the aims of the school. Every pupil and member of staff is allocated to a house, which provides a sense of identity, pride and loyalty through opportunities to represent the house and contribute to its success through a variety of competitions and activities. New pupils are allocated to houses with spaces. Allocation is also influenced by the abilities, interests and aptitudes of the new entrants; talents are distributed evenly as far as possible between houses. Younger siblings do not always follow their brother or sister in terms of house allocation; each young person is considered individually. Each pupil is allocated an academic tutor who is attached to each house and oversees their academic progress. Tutorial year groups typically comprise around 12 pupils. Pupils register in their house each morning and see their tutor at least once a day. The Housemaster or Housemistress, their assistant or tutors deal with any pastoral or academic issues. Each house has a Head of House who, alongside their monitors, helps to organise house competitions and represent the opinions of the pupils to the house staff. House Meetings are held weekly. The academic year begins with the house singing competition with considerable time dedicated to practising the three songs chosen by the Upper Sixth. In the Michaelmas Term, there are house swimming, rugby and hockey competitions. The Barney Bash and Run take place during the Lent Term, followed by cricket, athletics and sports day in the Trinity Term. Further house competitions take place on Wednesday afternoons throughout the year including house art, cake decorating, public speaking, chess, music, table tennis, basketball and many more. Bowes House was formed in 2002 to accommodate the increasing number of day girls in the school. The house is located close to the Bowes Museum, hence its name, and its shield is based on the shield of the Bowes-Lyon family. As an Old Barnardian (1996-2003) and a founding member of Bowes House (UVI 2002-2003), I understand first-hand the importance that the role of the house plays in a student’s time at Barnard Castle School. The friendships formed in the house and the school are long-lasting and the support given to all students is second to none. Whilst pupils are encouraged to mix and socialise with members of other house, they are all very proud to represent Bowes House. Marwood House was formed in 1993 for the exclusive use of day girls. It used to lie on the parish boundary of Marwood, hence its name, but later moved to refurbished accommodation adjacent to the school field. We aim to create a supportive and comfortable environment in which pupils are able to mature and form relationships with each other whilst fostering independence and an ability to develop interests outside the house. We promote achievement and high expectations within a happy, caring, purposeful and structured community. We also encourage the development of a spiritual and moral dimension in pupils’ lives. The virtues of self-discipline, diligence, mutual respect and good citizenship are actively promoted. We support girls in the transition from childhood towards adulthood, encouraging them to develop a sense of responsibility and self-respect. With a structured set of rules which benefit all pupils, we promote high standards of behaviour and encourage pupils to accept responsibility for their actions and recognise the impact of their behaviour on others. It is also my role to ensure that the girls are well cared for, happy and busy, and that they make the most of their opportunities at the school. Whilst pupils are encouraged to mix and socialise with members of other Houses, they are very proud to be members of Marwood House. Strong and long lasting friendships are forged during their time in the house. Dale House was created as a result of increasing numbers of day pupils in Teesdale House, which was divided to create Dale and Tees House. Dale House lies towards the rear of the main school building. Pupils are proud to be a member of Dale House. As they progress through the school they certainly see it as their house and strong and long lasting friendships are forged. Durham House was one of the original boarding houses established when the school moved into its present buildings in 1886. As a result of reorganisation, it began a new life in September 1995 as one of three day boy houses. Durham House occupies a site which forms a bridge between the other day boy houses of Tees and Dale and the existing areas of York and Northumberland. We run a thriving tuck shop from 4pm-5pm and also charge annual subs with profits invested in improving common rooms, prizes and tutor trips. I like to see house members take pride in representing Durham house in all the wonderful and varied competitions the school offers. It is of great importance to me that members of Durham house are happy and hard-working, so pupils are encouraged to communicate closely and regularly with me or their tutor. Tees House is a boys’ day house. It was formed in 1982 when the single existing day-boy house, then called Teesdale House, was divided into Tees and Dale houses. Day pupil numbers have grown since those times and in the nineties a third day boy house, Durham House, was introduced. Tees House is currently home to around 70 boys who share one large and three small common rooms. Housed on the top floor of the Main School building it boasts one of the finest views in school; overlooking the playing fields and beyond. The ethos of Tees House echoes the simple sentiment that students will “get out what they put in”. Students who get stuck in, embrace the opportunities that Barney offers will reap the massive rewards that come hand-in-hand. As Housemaster, I value energy and commitment but I also like to see humour, independence and a sense of community. One of Tees’ greatest strengths is its history of success in house competitions and wonderfully long list of current and former pupils who excel in an academia and in extra-curricular achievement.